On Wednesday, March 1st, 2017, Anova’s Special Events Coordinator Jean Meilleur paid a visit to the kind folks at RBC Dominion Securities in downtown London. There was a cheque presentation of $5,000 to recognize International Women’s Day and support Anova and the ‘Walk a Mile in Her Shoes’ event to take place on Saturday, September 30th, 2017. They also donated rack upon rack of all manner of clothing and footwear to be sold at Mine101! 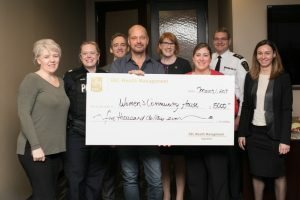 Speakers included London Police Chief John Pare, London Police Officer and Anova Board Member Jennifer Noel, Kelly Scrivens – Branch Manager – RBC Dominion Securities and Heather Austin – Regional VP – RBC Royal Bank. Pictured from left to right: Deb Meiller, Jennifer Noel, Kelly Scrivens, Jean Meilleur, Heather Austin, Trish Boughner, Chief John Pare and Jessica Thomas. Jean ended the event with a touching solo version of the Beatles classic, ‘The Long & Winding Road’, to represent the ongoing journey that women take from fear to freedom. Much thanks to all involved and looking forward to a robust relationship with RBC Dominion Securities as a great community partner!